MESA is written in MEL scripts, but is also a sort of working directory that include the icons and the mel scripts. The Mesa scripts do not have to be copied into %USERPROFILE%/maya//scripts/, the path where maya will check for the scripts, is configured directly into the environment variables of Windows. 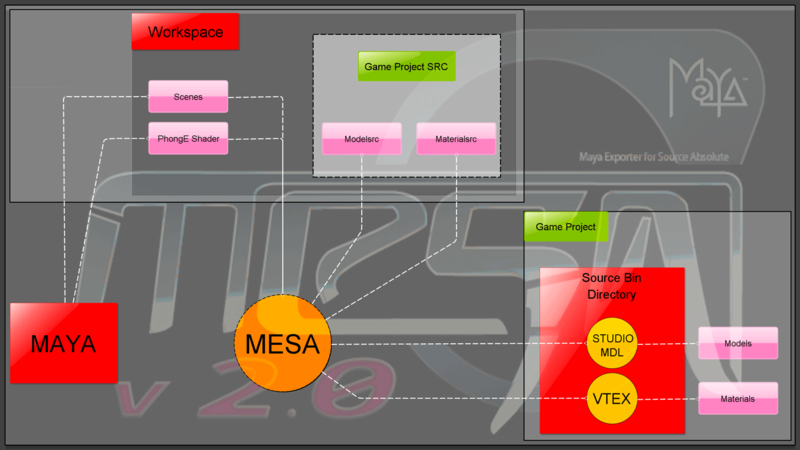 MESA come with some Predefined projects directories for 20 valve software games titles . All this projects directories are use to store your source files, before the files are converted into the readable format for the Source Engine. this project directory set into the Environments variables with this name : GAME_PROJECT_SRC. The location on your hard drive of the converted files is the GAME_PROJECT, and is also a environment variable. save scene in Scene directory. Note : This is the common task when you create a news scene. Note : the QC script and the SMD files will be exported to modelsrc folder. When the scene is saved into %GAME_PROJECT_SRC%/scenes/props/myscene.ma, the automatic path where the QC scripts and SMD files will be exported will be %GAME_PROJECT_SRC%/modelsrc/props/myscene.smd . With the Materials and Textures, a TXT file that contains some of the arguments required by VTEX.EXE to compile properly the TGA files into the VTF format. The QC scripts, SMD files and TGA textures from the the GAME_PROJECT_SRC will be exported into the GAME_PROJECT. %GAME_PROJECT_SRC%/materialsrc/models/props/my_texture.tga to %GAME_PROJECT%/materials/models/props/my_texture.vtf /vmt .